Tired of waiting for your fleet? Turn around delivery times on medical carts and equipment often take far too long, and then leaves you with the daunting task of assembly. Space Saving Solutions has partnered with Touch Point Medical to create the Stocking Distributor Program; The SDP provides the End User with a better price, lead time, and maintenance program. We've got you covered! Call today to learn more about our end-to-end solutions for every project! Now Offering The TeleMedicine Cart! Altus provides a great selection of wall mounts, specifically tailored to fit your space. Offering the best in technological and ergonomic support. Reach Workstations can pivot, raise, lower, fold up, & outstretch to keep you on the go. Not only can Reach independently swivel, it offers a 59” extension and can raise or lower 14”, allowing you to make each adjustment as needed. With loads of possibilities, the Reach wall Mount gives each member of your team the freedom they need. Flexline offers a nano-lithium power supply, multiple mounting options, and added internal storage options to save your that precious floor space. In addition to extra storage, FLEXLINE computer carts feature 3", 6", 9", and 12" drawer heights to store your supplies and drawer dividers to keep those supplies organized. 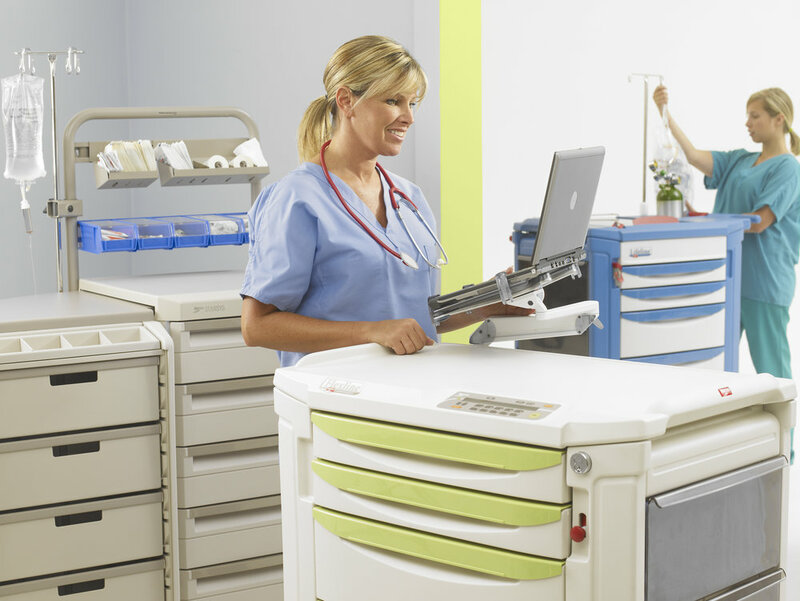 The Metro mobile computer cart features a clean design, with rounded features allowing you to maintain a sanitary and clean environment. Space-saving design, Easy-to-adjust, Durable construction. Take your point-of-care system to the next level with the TouchPoint Medical AccessMount. This innovative wall mount helps keep your vital information within arms reach. This compact model was designed to be as versatile as possible for your smallest of spaces, while maintaining a sleek and sophisticated appearance. Fully adjustable with single hand motion, a 40 lbs weight capacity, and three track lengths (16" (406mm), 32" (813mm) 48" (1219mm), you can count on versatility and reliability in one beautiful and streamlined package. Expect, safety, quality and assurance from Omnimed. Get from point A to point B with ease with the Ergo Computer Transport Stand. This beautiful stand offers a tilting monitor arm and keyboard tray, as well as a 75mm/100mm VESA monitor mount. It can accommodate a multitude of PC sizes (9" H x 1.75" W x 9.75" D to 16.5" H x 6.5" W x 18" D), and comes complete with a cord reel to keep you from getting tangled. Need a little extra reach? Upgrade your cart by adding a cord wrap, so you can plug in and go! Move one, two or three monitors with ease! The HX desk mount monitor arm has been designed with you in mind, utilizing functional design to maximize workplace efficiency while offering a sleek appearance. This model comes equipped with cable management to keep things tidy, folding arms to save space in tight areas, and patented CF technology to give you the best range of motion possible. Customize your model by upgrading with Ergotron’s HX Triple Bow Kit, giving you the ability to add up to three monitors. Too busy running your business to worry about installation? No problem! We offer these services for EVERY product we sell. Our goal is to deliver a product to an end user that is ready to work. We unbox, count for accuracy, assemble properly, adjust if necessary and then discard our cardboard and waste! Space Saving Solutions uses professional installation materials and top installation technicians to ensure cleanliness, consistency, functionality and safety. From industrial strength wall anchors to universal medical equipment management rail, our materials and solutions are meant to last. Our Technicians are fully qualified to support all our products, trained in infection control procedures in multiple medical environments and able to develop an infection control plan for each installation area. Like saving time and money? Logistics warehousing is where it's at. Space Saving Solutions offers turnkey storage and transportation services to help our customers save time & money. Need some extra storage space? Do you find yourself placing frequent orders at higher cost due to lack of warehouse space? Well now you don’t have to - Space Saving Solutions can warehouse your orders until you're ready to receive them! That means you can source more product at a better cost and receive them as you need them - Less ordering, less paperwork, less headache! We can store large orders in our warehouse and ensure everything ready for delivery so you can focus on a improving your facility and save time on checking shipments. We work closely with our customers to establish the most efficient delivery scheme to keep excess inventory to a minimum. We are able to ship products on behalf of the customers for returns to manufacturers, etc. Become Master Of Your Domain With Preventative Maintenance! Need to repair your fleet? Space Saving Solutions maintains a network of authorized service providers for ALL major manufacturers of Mobile Computing Hardware. Our understanding of the healthcare industry coupled with solid equipment knowledge allows us to adapt to your needs. Whether you need on-site repair or a custom maintenance plan to keep your Point of Care equipment in optimal condition, we have you covered. Call us today to schedule a plan that suits your vision and budget! When it comes to covers, we're giving you carte blanche! Medical cart covers come in many shapes, sizes, and varieties. Sometimes it can be a daunting subject - not only do you need them to be sanitary, durable, and cost effective, you want them to look great too! We offer an extensive range of cart covers in various fabrics, colors, & sizes to fit your specific needs. • Available in Dusty Rose, French Vanilla, Pistachio, Powder Blue, Royal Blue, Sand, Red, and White. Reinforced Vinyl, 10 oz. / sq. yd. Need help getting started? Call us today and we'll help you find what fits your business and your needs.